For nearly the same length of time, value stocks — those bargain-priced shares which often pay higher dividends — have underperformed growth stocks. As a result, investors who favor value stocks must certainly feel like they are on an unrewarding investment odyssey of their own. Yes, in theory. Academics have long argued that investors should rationally expect to be compensated for the risk of owning stocks. The higher a company’s perceived risk, the higher a rate of return investors expect. In demanding higher returns, investors pay lower prices for a company’s stock, relative to its earnings, cash flow, or other fundamental measure. Paying lower prices, the theory goes, paves the way for higher future returns. Recently, however, this has not been the case. Value stocks have underperformed growth stocks in dramatic fashion. Over the past 10 years, for example, value stocks in the United States have returned less than 7% per year, while growth stocks have returned just north of 9% per year.3 Globally, value stocks have underperformed in similar fashion. O value, where art thou? Should this prolonged absence of a premium cause investors to now question the value of value stocks? Hardly. A “disappearing” value premium, even over a 10-year stretch, is nothing new. In fact, since the late 1970s, 27% of all rolling 10-year periods have seen a negative value premium.4 Actually, if at any point in the past 35 years you evaluated the performance of equities over the previous decade, nearly 30% of the time you would have found that growth stocks outpaced value stocks. Even the steeliest of investors may lack the emotional fortitude to cling to a concentrated strategy that can remain out of favor for so long. Ironically, it is this uncertain investment journey in the absence of the value premium which may set the stage for its eventual return. As returns languish, prices fall and the opportunity for disciplined investors to earn the premium is restored. This reversal of fortune can be swift and unexpected, as in O Brother, Where Art Thou? Near the end of the film, the convicts are set to be hanged by the sheriff, only to be saved by the bursting of a dam that floods their immediate surrounding. Similarly, markets can shift in an instant and the value premium can return with force. How did that happen? Remarkably, in the five months from November 2000 to March 2001, value stocks outpaced growth stocks by a whopping 35%. In other words, we should be careful about extrapolating the recent past into the future — both can change quickly! 1. January 1927 through December 2014; Fama/French Indices, with utilities. 2. Growth of $1, October 1985 through October 2015, Russell 1000 Value and Growth Indices for large cap; Russell 2000 Value and Growth Indices for small cap. 3. 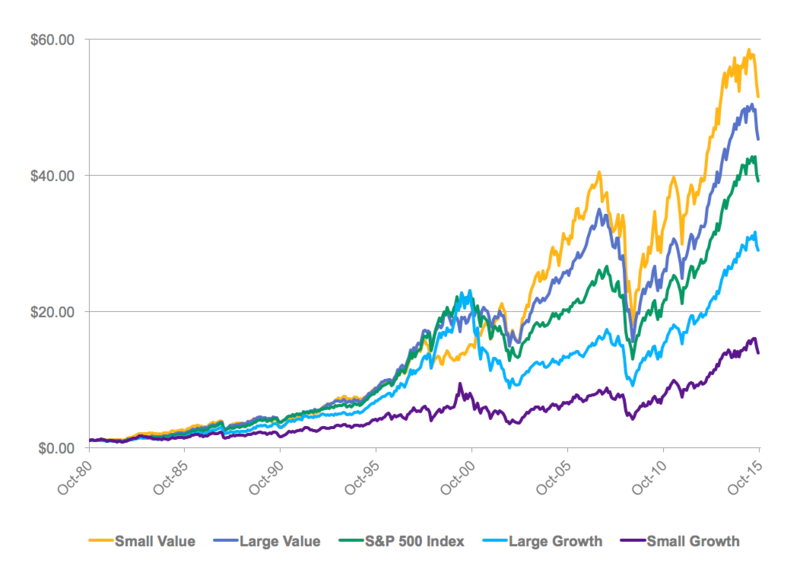 November 2005 through October 2015; Russell 3000 Value and Growth Indices. 4. 10-year annualized performance difference, Russell 3000 Value Index minus Russell 3000 Growth Index. 5. For example, from November 2005 through October 2015, a market-weighted global portfolio as measured by the MSCI ACWI Index (USD) returned 6.2% per year. Over the same period, the following hypothetical value-oriented global portfolio returned 7.2% per year: 30% Russell 1000 Value Index, 15% Russell 1000 Growth Index, 10% Russell 2000 Value Index, 5% Russell 2000 Growth Index; 10% Dow Jones US Select REIT Index; 10% MSCI EAFE Value Index, 5% MSCI EAFE Growth Index, 5% MSCI EAFE Small Cap Index, 6% MSCI Emerging Markets Index, 2% MSCI Emerging Markets Small Cap Index, and 2% MSCI Emerging Markets Value Index. All international indices are gross dividends. 6. November 1990 through October 2000, and June 1991 through May 2001; Russell 3000 Value and Growth Indices. Good post, Dougal. As another way of stressing the importance of the diversification benefits that you mention, I looked at how the correlation between value and growth portfolios changed, in each market cap tier, since the beginning of 1986. Among small-cap stocks (Russell 2000), the correlation between value and growth portfolios was usually between 87.7% and 95.2%, but has dipped as low as 54.9% (in early 2001). Among mid-cap stocks (Russell Midcap) the value-growth correlation was usually between 85.8% and 93.2% but dipped spectacularly to 8.8% in late 2000. Among large-cap stocks (S&P 500) the value-growth correlation was usually between 83.9% and 91.9%, but dipped as low as 47.7% (also in early 2001). Even investors who pay close attention to persistent market anomalies, such as the value premium, can’t know when returns will be consistent with the anomaly and when returns will run counter to them. (Similarly, I often point out that returns are positive during only about two-thirds of months even during an undisputed bull market.) Yes, make use of the value premium and other anomalies in allocating your portfolio–but no, don’t go to extremes! p.s. I compute correlations using monthly returns and a DCC-GARCH methodology. Thank you, Brad. I enjoyed reading the statistics you cite, as well. From my perspective, it reinforces the decision–assuming one believes there is a value premium–to maintain consistent exposure to value, whatever that exposure is for a certain investor. It’s not an earth-shattering observation to say the risk of missing it altogether when it does appear (a la those months in 2000-2001) is higher with a timing strategy. 1) Is this the dotcom frenzy again? Is this time different? Maybe it is, considering that people did learn their costly lessons 15 years ago. Many internet companies are indeed making growing profits nowadays. However, optimism is HIGH right now, a slight miss of expectation may send everybody into havoc (as it always does, ask Nassim Nicholas Taleb). 2) The classification of “value” and “growth”, at least to me, makes no sense. But where do the other two fit into? High valuation with no/low growth -> ??? Low valuation with high growth -> ??? I think Carl Icahn will be annoyed by the fact that Apple, a low-teens P/E stock, is not classified as a value stock. Wall Street simply ignore the fact that growth is always a component in the calculation of value. 3) Anyway, paying premium for optimism is always dangerous, especially when “Growth” outperforms “Value”. Thanks for reading the article and taking the time to post a comment. I referenced the Russell Indices, while admittedly far from perfect in distinguishing “pure” value from growth from a research perspective, due to the availability of data and their familiarity with investors/readers. Absolutely agree with Fung C.F. The classification of Value and Growth makes no sense, at least to me! The importance of the value/growth distinction comes from the research done by Eugene Fama (who won a Nobel prize for it) and Dan French. The Fama-French three-factor model separated excess stock returns (actual returns minus the risk-free rate) into the small-stock factor (called SMB for “small minus big”) and the value factor (called HML for “high minus low,” referring to those stocks with the highest ratio of book value to market value compared to those with the lowest ratio) plus the market factor (basically everything not explained by SMB and HML). Dan French’s web site (http://mba.tuck.dartmouth.edu/pages/faculty/ken.french/data_library.html)shows the monthly values from July 1926 through October 2015, and over that entire period the value factor has averaged 4.62% per year, meaning that value stocks have outperformed growth stocks by that amount on average. The small-stock factor has averaged just 2.56%, so the value factor has been much more important than the small-stock factor. Lots of additional research has focused on (1) other factors that appear to be important, as well as (2) other ways of identifying “value” versus “growth” stocks. Basically, however, the way that “value” and “growth” are defined for the purpose of this research means that we are not looking at things like a low-valuation stock with no/low growth or a high-valuation stock with high growth or a high-valuation stock with no/low growth or a low-valuation stock with high growth. Thanks Brad for your comment. As a value investor myself, I truly believe that “value” will continue to outperform “growth”, if I have to use that two classifications. Fama-French Three-Factor Model makes perfect sense to me (but not Efficient Market theory though). My point is not about that. Comparing “value” and “growth” is like comparing apple and orange. It makes more sense to compare “value” with “non-value/expensive” and “growth” with “no/low growth” but nobody would do that because the results are super obvious. So people just split the stocks into “value” and “growth” for whatever sophisticated reasons they have. To simplify my point, as a value investor myself, there are stocks in the “value” segment that I wouldn’t buy and there are stocks in the “growth” segment that I would buy. Growth is always a component in the calculation of value. Yes, Fung C.F., but the words “value” and “growth” in this context are mutually exclusive. That’s not to say you can’t identify a company that you think is a good “value” and also has good “growth” prospects: it’s simply to say that when we talk about research showing that value stocks outperform growth stocks (or that they don’t, in recent history), we’re using those two terms in carefully defined ways, and it’s not possible for a company to be both “value” and “growth” in that context. Basically, we talk about value stocks outperforming growth stocks simply because it’s awkward to say that stocks with high ratios of book value to market value outperform stock with low ratios of book value to market value. Good discussion. What about sectors/valuations that led during these phases…tech, banking, oil…any thoughts? I appreciate the deep analysis and thoughtful commentary. Thank you for bring this information to light. Higher required returns doesn’t equivalate to higher realized returns. This is a good thing since value indices tend to be dominated by financial firms, leveraged black boxes powered by morally questionable leaders. I can imagine financials trading at lower valuation multiples and I can imagine these companies going busts in cyclical downturns. Maybe the real question is – “what is value?”, and does the Fama-French definition for value make sense? The Fama-French research doesn’t attach moral judgments to the terms “value” and “growth” (or, more accurately, “high book-to-market” and “low book-to-market”); it simply observes that high B/M stocks have outperformed low B/M stocks most of the time. It may be that high B/M stocks EXCEPT FINANCIALS have outperformed, but I haven’t heard that. It may be that high B/M stocks EXCEPT FINANCIALS will outperform in the future; I don’t know. As I’ve mentioned in other comments, “value” in this context does NOT mean that a particular individual stock will outperform in the future, only that the group of stocks sharing that characteristic have usually outperformed in the past. Last time, value managers got sacked prior to the turn. Maybe that will happen again. I am waiting for clients to leave me. A few are restive.